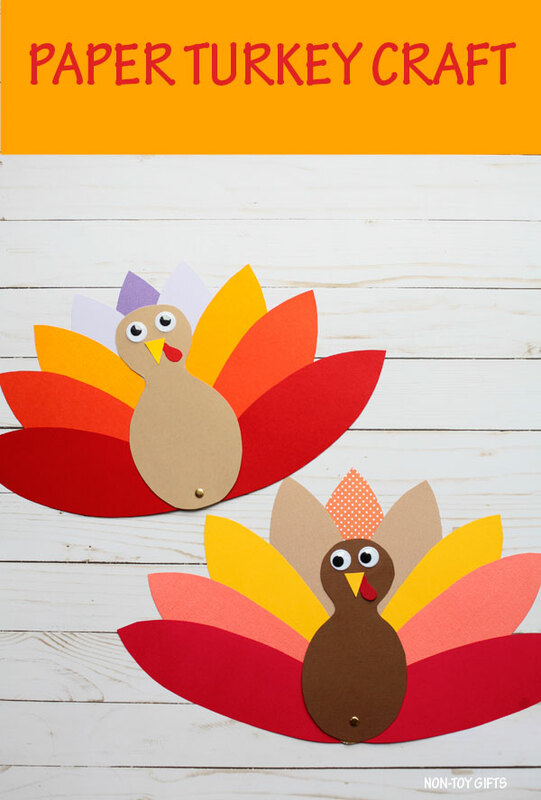 Celebrate Thanksgiving with an easy paper turkey craft for kids. The craft comes with a template but you can also draw your own one, if you’d like. 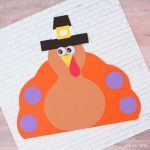 We’re sharing today a simple turkey craft for kids to make with colored paper. 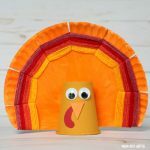 Preschoolers and kindergartners will particularly like it as it involves a lot of scissors cutting – one thing little kids like to do once they’ve mastered this skill. Our turkey comes with nine feathers and a nice feature that makes the feathers spread out. All the cutting will keep the kids busy while mom is busy in the kitchen. 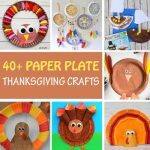 If you’re hosting the Thanksgiving party it would be nice to set up a craft table for all the kids and have them all create their own paper turkey. Of course, this makes also a nice classroom craft for the holidays. 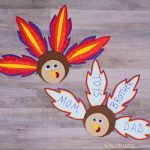 Students can choose their favorite colors for the feathers and write on each feather one thing they are thankful for. 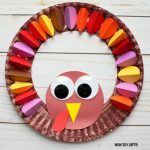 This paper turkey is a nice addition to our Thanksgiving crafts and a perfect fit for our collection of 100+ easy crafts for kids. 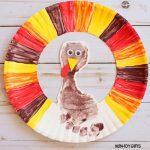 A variation of this craft would be to replace the feathers with handprints in different colors. We love handprint crafts as they are really sweet and make great keepsakes for the family. Most of them can be turned into handprint gifts. Classroom template (for crafting with more kids): print on colored paper and cut out. 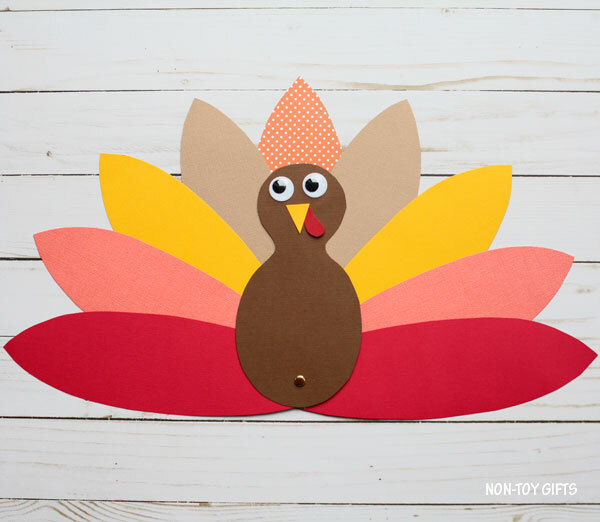 Go ahead and print either the home or classroom version of the template and let’s start crafting our cute little turkey. Print the home version of the template. Cut out the patterns and trace them on colored paper. 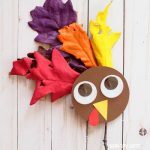 To make the paper turkey you will need 1 brown or beige turkey body, 9 colored feathers, 1 yellow or orange beak and 1 red snood. We used cardstock paper for both the body and the feathers but you can replace it with construction paper for the feathers. 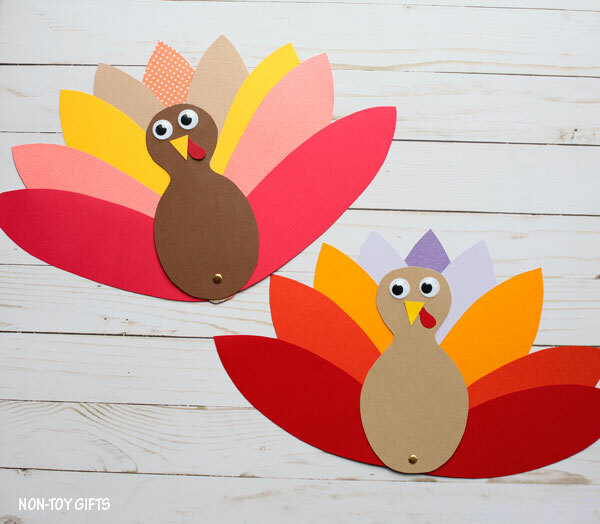 Feel free to use any colors for the feathers, either your child’s favorites or what colored paper you have at hand. We try to stay in the yellow, orange, red and purple color combo with our turkeys. Glue the snood and beak on the brown body. Add the googly eyes above of the beak. Make a hole at the bottom of each feather as well as the body and attach all the feathers to the back of the body with the help of a paper fastener. Print the classroom version of the template. Print out the patterns on corresponding colored paper. The turkey body is printed on brown or beige paper, the beak on yellow or orange paper, the snood on red paper and the feathers on the color(s) of your choice. 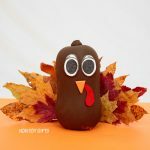 To make the paper turkey each student will need 1 brown or beige turkey body, 9 colored feathers, 1 yellow or orange beak and 1 red snood. Use card stock paper for the body and construction paper for the feathers, snood and beak.